Where possible, all floors, walls, and trusses are pre-assembled for quick and easy assembly. If you have limited time or simply want to enjoy your Summerwood design as soon as possible, consider purchasing one of our pre-assembled kits. This format is designed for quick, convenient assembly, with most of the components pre-assembled and ready for you to put together on site. Depending on the size and complexity of your design, our basic pre-assembled kits can generally be assembled by two or three minimally skilled people in two or three days. As products increase in size (cabins, garages) and complexity (dormers, 5 sided roofs, custom options) the time required will increase. Some basic carpentry knowledge is also helpful on larger and more complex designs. The convenience of pre-assembled doors, windows, flower boxes, shutters, and many other fixed options. All required fasteners and hardware including screws, nails, hinges, and door handles. Please note that with the exception of most pre-assembled gazebos, shingles are not included in our kits. Cedar shingles and EPDM roofing (flat roofs) may be purchased with your kit. Asphalt shingles may be easily purchased at your local building store. Some assembly is still required. “Pre-assembled” means that major structural components such as walls, trusses and floors are usually built and framed for you. 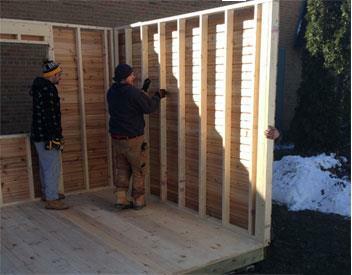 Please note that in certain cases (enhanced siding package, larger walls), the walls may need to be sided on site. Windows and doors are framed allowing you to conveniently pop them into place on assembly. Pre-assembled walls can be quite heavy. Depending on the size, you will need two to four people to assist with unloading. It was great working with Summerwood, the team did an amazing job guiding me through the assembly process. Our garden shed looks amazing and we’re excited to have it enhance our new yard.